How have I never reviewed this product till now?! The Snow Fairy shower gel is not only the first ever product that I tried from lush, it is also my all time favourite product that lush have ever created (I really should have reviewed this sooner). This bright pink and rather sparkly shower gel is the ultimate Christmas product. This shower gel has become a firm favourite amongst many lush fans! Although only released as part of the Christmas range this always gives me enough time to stock up to keep me going through the rest of the year. Although I love all things pink it is defiantly the scent that won me over with this shower gel. The Snow Fairy shower gel is the sweetest shower gel I have ever tried. It’s smells of a mixture of candy floss and pear drops creating a very sweet sugary mix. If you have a sweet tooth this shower gel is defiantly for you. The Snow Fairy shower gel contains a good helping of glitter which gave the gel a beautiful shimmer and makes it twinkle when it catches the light. However don’t worry to much the glitter is very light and won’t leave you looking like a disco ball. This shower gel lathers up very well and leaves your skin feeling lovely and soft. The scent of this shower gel also stays on the skin for a long time after use. The Snow Fairy shower gel can also be use as shampoo (which is rather impressive). Overall i LOVE this shower gel! If you haven’t tried it I really recommend that you grab yourself a bottle this year. It is also perfect to give as a lovely present this Christmas or as a cute little stocking filler. 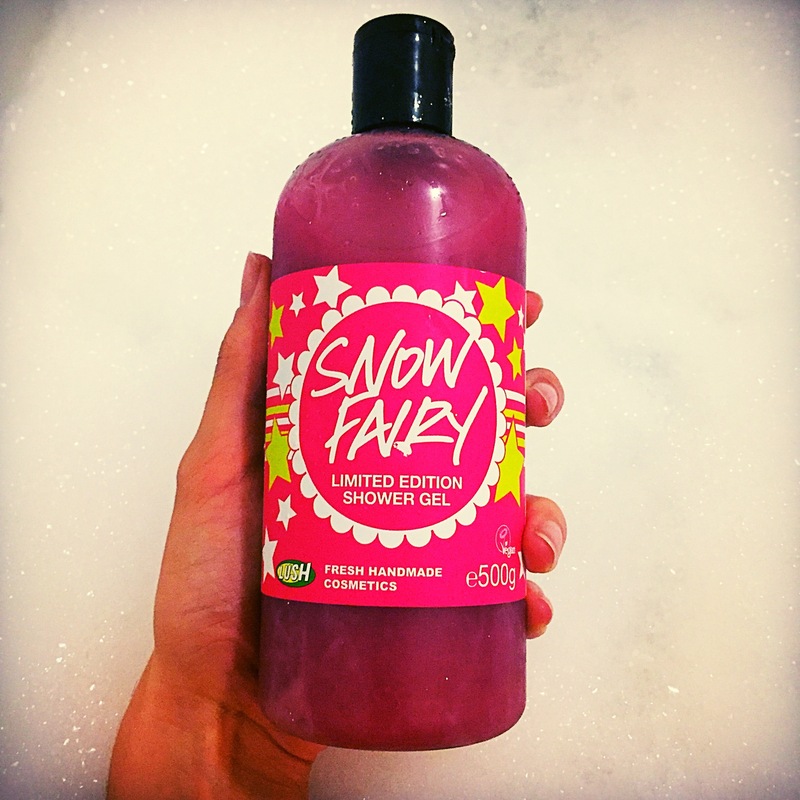 Have you tried the Snow Fairy shower gel? TOP TIP: Give the bottle a good shake before use as the glitter tends to settle at the bottom. INGREDIENTS: Water, Sodium Laureth Sulfate, Sodium Cocoamphoacetate, Propylene Glycol, Lauryl Betaine, Perfume, Lactic Acid, Synthetic Musk, Titanium Dioxide, Blue Glitter, Methyl Lonone, Benzyl Benzoate, Colour 45410, Colour 45380, Methylparaben. Snow fairy is something I wish I liked. I love the colour. But the smell, it’s just too sweet for me.